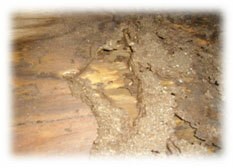 Subterranean termites invite themselves into homes at cracks in the foundation or anywhere there is wood in contact with soil, eating through decks and siding to form their nests in the moist soil. 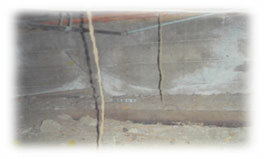 Subterraneans make tunnels called “mud tubes” the diameter of a pencil up the side of concrete walls or cinderblocks. In these tubes they move from the soil to the structure without exposing themselves to the sun, tunneling their way underground to get to the wood. Subterranean termites are far more destructive than dry wood termites, so it is wise to take quick action in the case of subterranean termite infestation. 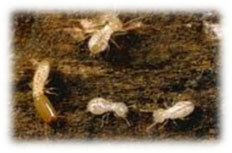 Signs of termite infestation include swarming of winged forms in fall and spring and evidence of tunneling in wood.